Commando Commodore 64 – Play in your Browser! 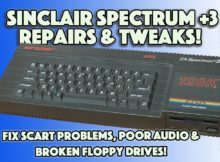 Sinclair Spectrum +3: Disk Drive, Audio & RGB SCART fixes! Better Sound and Video! 5000 Subscribers FREE Giveaway Celebration! Win Free Stuff! A BIG box of MSX Computer goodies! Ebay win box opening! © 2019 Mark Fixes Stuff – Retro game repair and reviews.